The installation meeting of Loyalty Chapter No 897 to install Graham Williams as first principal, Frank Parle as second principal and Chris Gleave as third principal was well attended by 39 members and guests. Pictured from left to right, are: Frank Parle, Graham Williams and Chris Gleave. 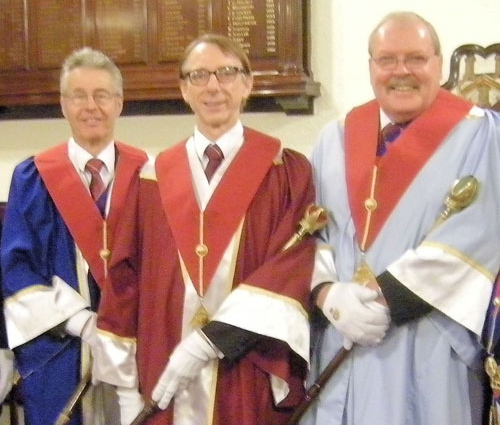 At the request of Chis Eyres, Alan Bristow read the dispensation and the chapter were opened in the traditional style by the three installing principals and the usual administration duties were undertaken. The minutes of the regular convocation held at the Masonic Hall Warrington in January 2018, having been previously circulated to all members, were confirmed and signed by the three principals. There was a report and Provincial Deputy Grand Director of Ceremonies Malcolm Bell was admitted. He announced that Paul Renton, Deputy Grand Superintendent, was without and demanded admission. He was admitted in due ceremonial style, accompanied by Colin Rowling, along with other grand and acting Provincial grand officers. Paul was greeted by the three principals and offered the sceptre of the chapter, he responded appropriately and returned it with eagerness. Les Norton gave the opening address, following which Graham Williams, Frank Parle and Chris Gleave were then invested as first, second and third principals respectively, in accordance with antient custom. The scripture readings and prayers were given by Colin Rowling, John Gibbon and Andy Barton. The robe addresses were given by Ian Lynch, John Gibbon and Les Newman. Graham then appointed and invested the officers for the ensuing year. Paul brought greetings to the chapter from the Grand Superintendent Tony Harrison and he hoped that the three principals and all the members of the chapter would have a very enjoyable year. He congratulated the companions who gave the readings and read the prayers, thanked the secretary and DC for the work they had put in before and during the meeting and thanked the grand and acting Provincial grand officers for their support. Paul gave the address to the companions, following which he presented a certificate to the first principal who indicated that, after the donation of £500, the chapter was now a Vice Patron of the Masonic Charitable Foundation (MCF) 2021 Festival and he congratulated the chapter on this fine achievement. The charity plate raised a total of £107. Following the first rising Paul, accompanied by Colin, the grand and acting Provincial grand officers then retired. At the close of the meeting Chris Gleave gave the valedictory address. A raffle was held at the social board which raised £120. Pictured from left to right, are: Frank Davies, Chris Eyres, Paul Renton, Frank Parle, Graham Williams, Chris Gleave, Colin Rowling and Andy Barton. Pictures and story by Alan Bristow.